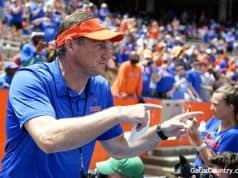 Florida’s defense got punched in the mouth early in its 36-17 loss to the Missouri Tigers and combined with the fact that they usually start slow, catastrophe could have permeated the first quarter. Their task for the second quarter, as has been most of the season, was to bail out a struggling offense and not allow Missouri to extend its lead. Series No. 5: 12 plays, 68 yards, 4:28 time elapsed, Missouri Field goal. 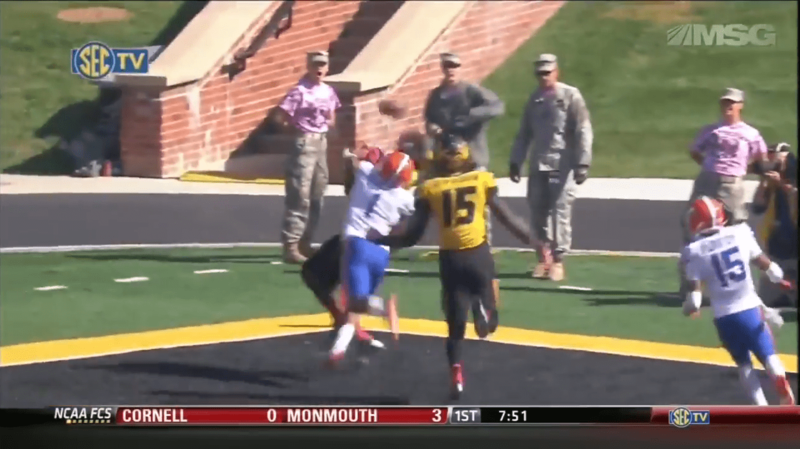 With Missouri driving, freshman cornerback Vernon Hargreaves demonstrates impressive cover skills on Missouri receiver L’Damian Washington. At first, Hargreaves gets beat by over pursuing what he thought was an out route by Washington. Now he has a gap to close because Washington heads up the sideline out of his break. As Washington looks back to track the ball, Hargreaves does as well, making up the gap while playing the ball in the air. Then Hargreaves turns to play the receiver and breaks up the pass. 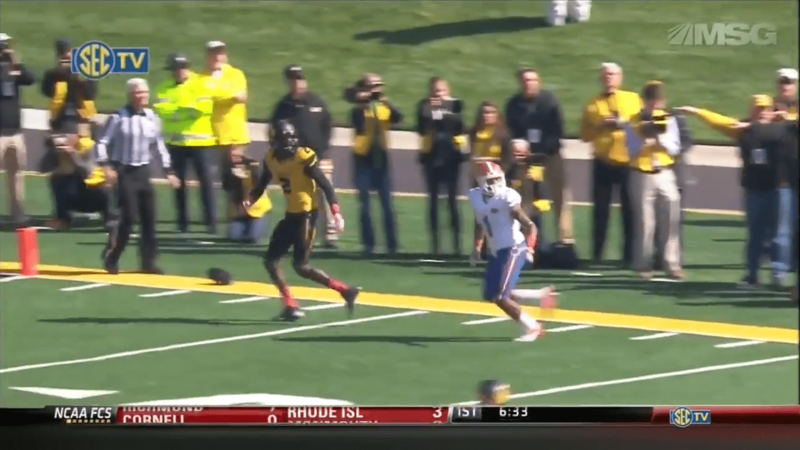 After a costly pass interference penalty by Florida defensive back Jaylen Watkins on a different play, Missouri gets the ball inside the five, knocking on the doorstep of the goal line. Florida’s defense slams it shut and it again goes back to impressive defensive back play. 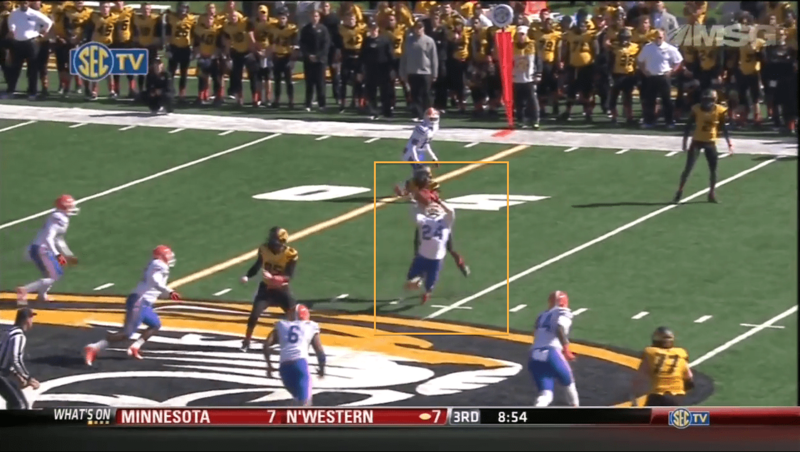 Here, Hargreaves is playing aggressively and even gets interfered with by the Missouri wide receiver. 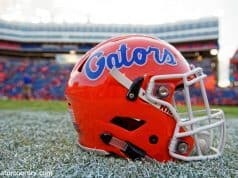 My guess is it went uncalled because Hargreaves was doing some grabbing of his own. Then on third down two plays later, Watkins makes a good play on a slant route, a short yardage staple. Watkins maintains outside leverage and allows Jimmie Hunt to go under him. Then he pounces, and breaks the pass up. Missouri is forced to kick a field goal, which kicker Austin Baggert makes to make the score 13-3. Series grade (B): As far as plays are concerned this was the longest sustained drive by either team all day. The Tigers were aided by some penalties, but when it mattered close to the end zone, the Gators stood firm. Series No. 6: seven plays, 40 yards, 2:43 time elapsed. 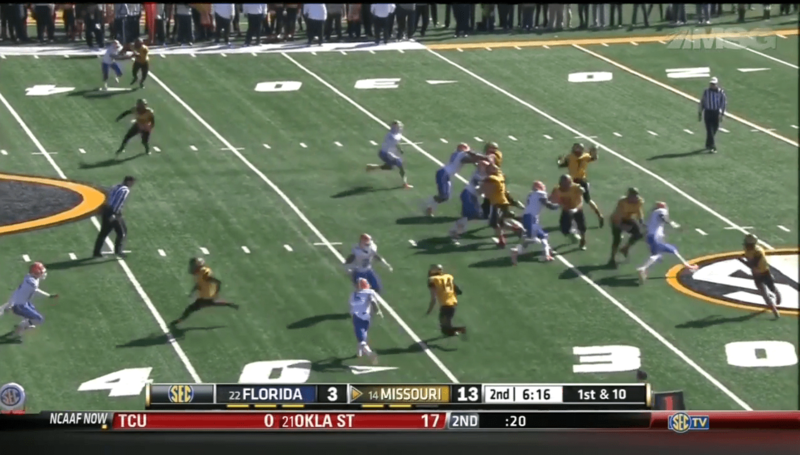 Missouri moves the ball through a series of short passes down to Florida’s 31 yard line. Like this one where Missouri quarterback Maty Mauk throws it where the blitz is coming from (like he’s taught and finds receiver Jimmie Hunt). 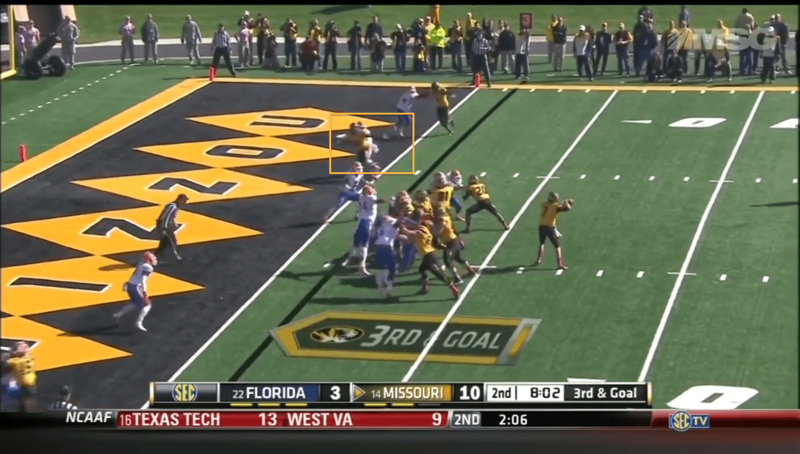 Florida linebacker Mike Taylor flinched slightly, tipping off Mauk to the fact that he’s blitzing. 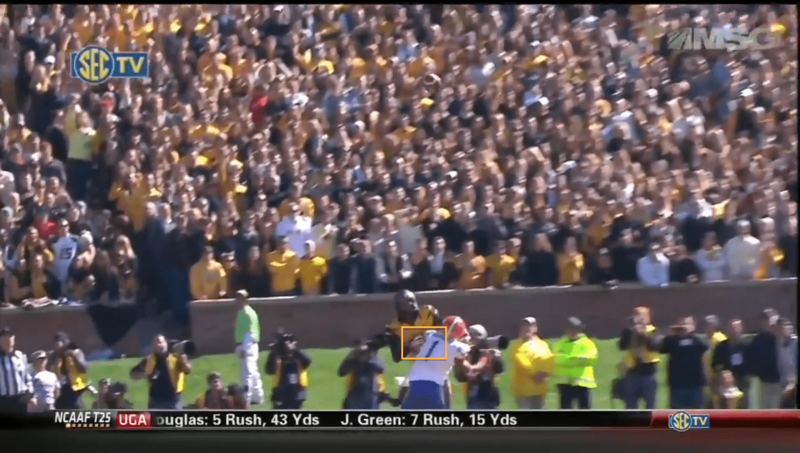 All Mauk has to do is catch the snap and throw to Hunt, which he does. 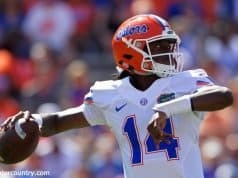 As good as Muak looked on this afternoon, at times he did things that reminded people he was making his first collegiate start, and Florida’s defense was able to take advantage of those things. 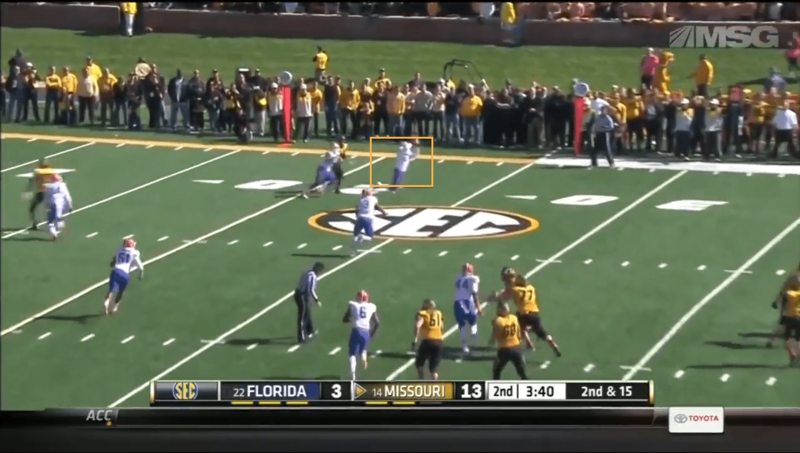 For instance, when Mauk tries to throw a pass from the far hash mark to the other side of the field and doesn’t put enough on it, Florida defensive back Brian Poole is there to intercept it. 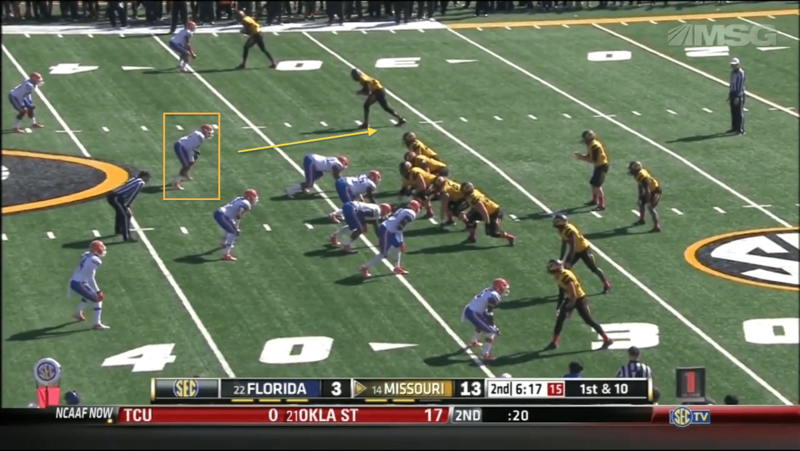 Series grade (A): Missouri had success, but Florida had the last laugh with a turnover. Series No. 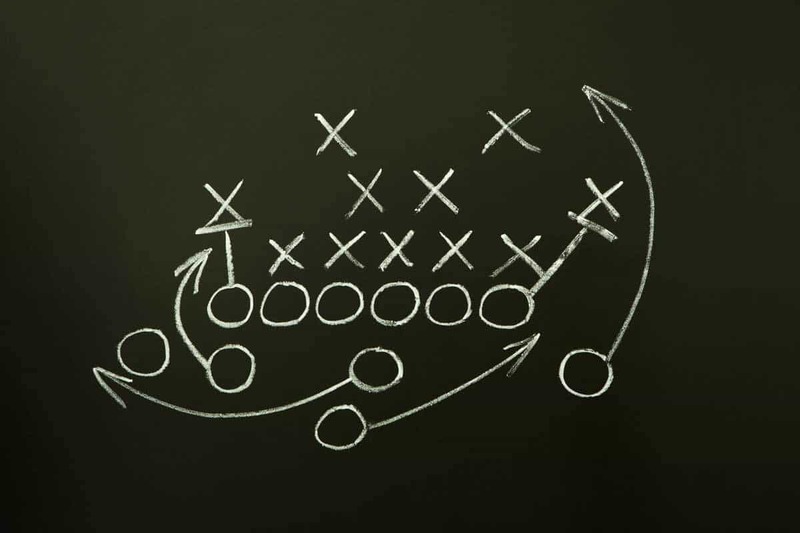 7: three plays, one yard, :30 time elapsed. 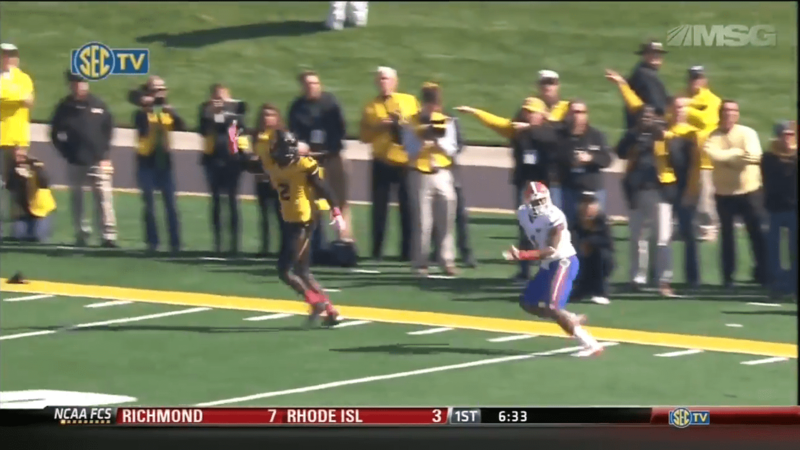 On first down, Poole almost has back to back interceptions when he jumps a lazy pass from Mauk. Missouri would settle for two more short yardage run plays before punting the ball to Florida with less that 30 seconds on the clock, the last significant game action of the first half. Series grade (A): Florida’s defense was able to end the half by forcing a three and out. Second quarter grade (B+): It was a bend but don’t break performance for Florida’s defense and it didn’t break. First half grade (A): This unit could have folded after allowing a big play early, but they didn’t. They made adjustments and only allowed the Tigers six points after their first seven.